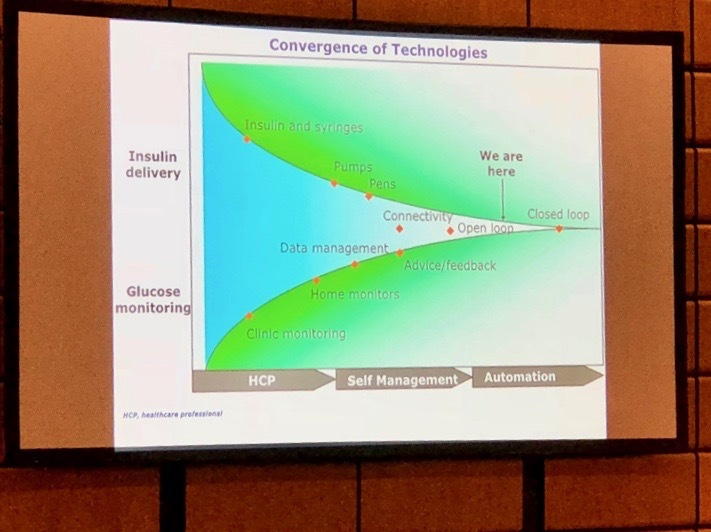 The annual International Conference on Advanced Technologies and Treatments for Diabetes (ATTD) took place in Vienna, Austria this February 2018. The conference drew experts, researchers, healthcare practitioners, industry representatives, and patient advocates from around the world to learn about the latest updates in diabetes technology and therapy. Focused primarily on technology, key updates show the progress being made in advancing treatment for people with diabetes. See below for hot-off-the-press highlights and stay tuned more details. With improvements in CGM systems and a greater push for outcomes beyond A1C, people are focusing more on time-in-range (i.e., time spent in 70-180 mg/dl per day) as a metric for diabetes management. See our recent article on experts’ thoughts about what goals for time-in-range should be and Adam Brown’s take on achievable goals to learn more about this topic. Two-hour warmup: the G6 will maintain the two-hour warmup seen in the G4 and G5, even as it eliminates required fingerstick calibrations. Similar/Improved accuracy: the G6 is expected to be as accurate as G5, with potentially better accuracy on day one – even though it does not require calibrations. “Urgent low soon” alarm: a new feature will alert the user when blood glucose is dropping rapidly and is expected to cross the low threshold. Based on the picture, this will occur about 15 minutes in advance of a potential low. Easy-to-use, push-button applicator: the G6 inserter has improved in a major way from the current sensor’s syringe-like design. 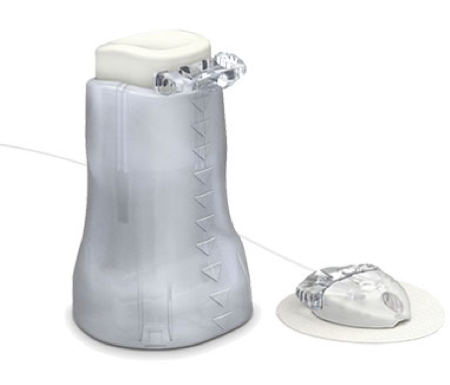 76% of pediatric users rated the new applicator as “didn’t feel anything” vs. 30% for the G5 inserter. 10-day sensor life: lasting for 10 days, the G6 will be on par with Abbott’s FreeStyle Libre. Acetaminophen blocking: the G6 will have no interference from acetaminophen (Tylenol). See our previous coverage on G6 updates here. 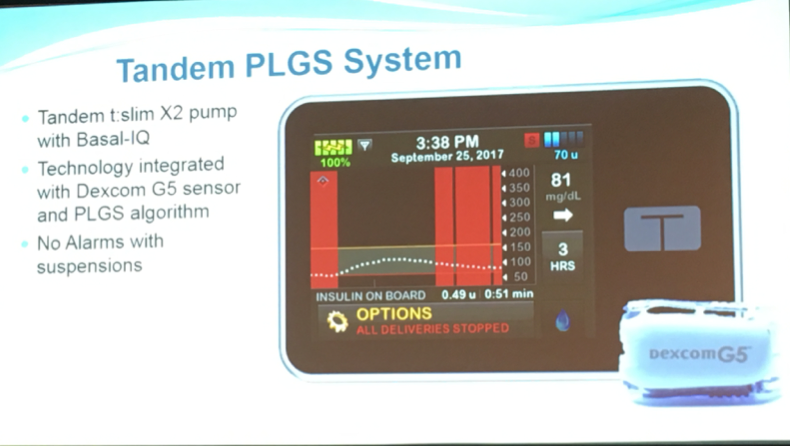 Tandem presented positive results from a trial that tested its t:slim X2 pump with an algorithm that predicts low blood glucose levels (based on Dexcom G5 CGM readings) and suspends insulin delivery to prevent hypoglycemia (low blood sugar). Once blood sugar levels start to rise, insulin delivery resumes. The algorithm, called “Basal-IQ,” works well for preventing lows. The trial, using the pictured pump with Dexcom’s G5 CGM, showed a 31% reduction in hypoglycemia (time spent below 70 mg/dl). This means participants in the study saw a decrease in time below 70 mg/dl of 19 minutes per day. The t:slim X2 pump with Basal-IQ does not alert the user when pausing insulin delivery, which many agree decreases nuisance and interruption. Tandem expects to submit the product to the FDA before the end of March, with launch currently expected in summer 2018. In the past two years, excitement for automated insulin delivery (AID) has steadily increased, with many people in the diabetes community using do-it-yourself (DIY) systems – many use an algorithm built by fellow people with diabetes (OpenAPS, Loop), an old Medtronic pump, a CGM, and a communication bridging device. Given very positive patient experiences, many are encouraging diabetes device manufacturers to build products with open-protocol communication standards, which would allow DIY users to more easily connect devices and build innovative apps and algorithms. In October 2017, JDRF introduced a new initiative to support development of open protocol AID systems. 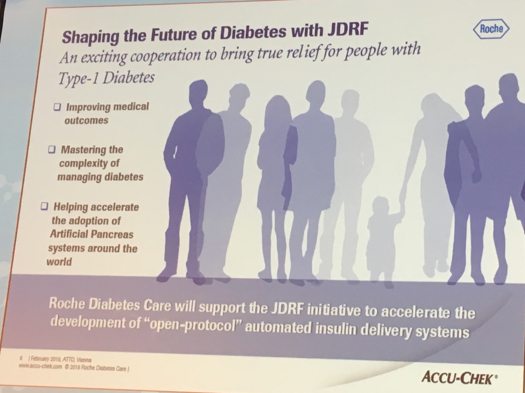 Notably, Roche announced their participation in JDRF’s initiative, becoming the first company to publicly commit to doing so. 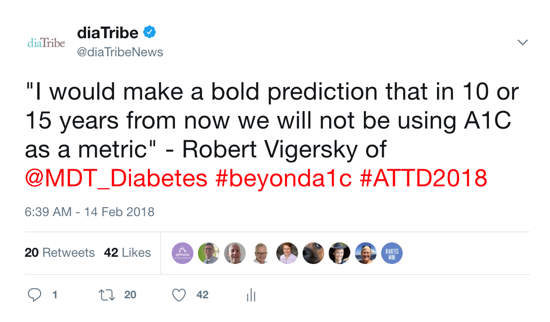 This news is very important, as it could pave the way for a whole new set of devices, apps, and algorithms that allow people with diabetes to mix-and-match the products that are the best fit for them – for instance, using a Dexcom CGM and Medtronic and a DIY algorithm running on a phone. Unomedical/Medtronic debuted the MiniMed Mio Advance, a new all-in-one, fully disposable inserter with a fully hidden needle. To insert the MiniMed Mio Advance infusion set, users peel the adhesive, remove the disconnect cover, place the set on the desired insertion site, and press the button to insert the infusion set. The simplicity allows users to easily insert a set with one hand. See the picture below and a video demo here. The set is currently available in the UK, Italy and the Netherlands, and will launch in certain European countries, Canada, and Hong Kong between now and April. It is expected to become available in more countries later in 2018. The set does not have FDA clearance at this time. Medtronic has submitted new MiniMed 670G data to the FDA, seeking approval for a pediatric indication (7-13 years). This will expand the official use from the current 14+ years. A study in 2-6 year-olds is also ongoing. The three-month study in 7-13 year olds showed similar outcomes to the adult and adolescent study – compared to a two-week period, the MiniMed 670G caused a 0.4% reduction in A1c in the pediatric population (from a beginning average A1c of 7.9%); time-in-range (71-180 mg/dl) improved by two hours per day; time under 70 mg/dl declined by 24 minutes per day; and time over 180 mg/dl declined by nearly two hours per day. Insulet presented new studies on its Omnipod Horizon hybrid closed loop, including tests during meals and exercise. The system kept glucose in range 75%-85% of the time (70-180 mg/dl). A five-day study in a hotel setting is ongoing. The Bionic Pancreas team tested a pumpable glucagon analog (dasiglucagon), which worked well for raising blood sugar in the automated, two-hormone system. A pivotal study testing the combo of insulin+glucagon system is now expected to start in June 2019. The new glucagon will come in a prefilled glass cartridge that slides right into the iLet two-chambered pump. With a strong focus on technology and therapy development at ATTD 2018, patient advocates and researchers advocated for a greater focus on issues of access and affordability. 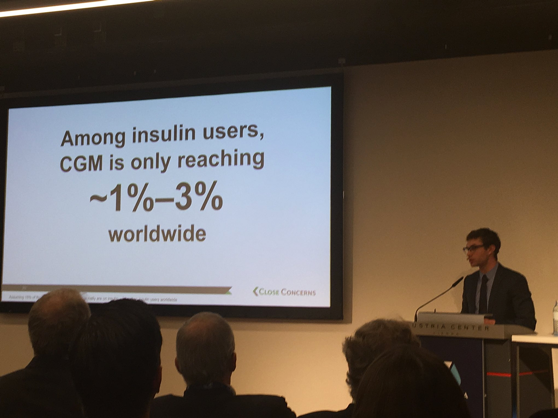 As exciting as all of these highlights are, diaTribe’s Adam Brown shared a disappointing statistic – among insulin users, CGM is only reaching about 1%-3% worldwide. CGM usage, however, is trending upwards, which shows that momentum is building on this front. Download Adam’s slides here and read more about diaTribe’s work on access here. 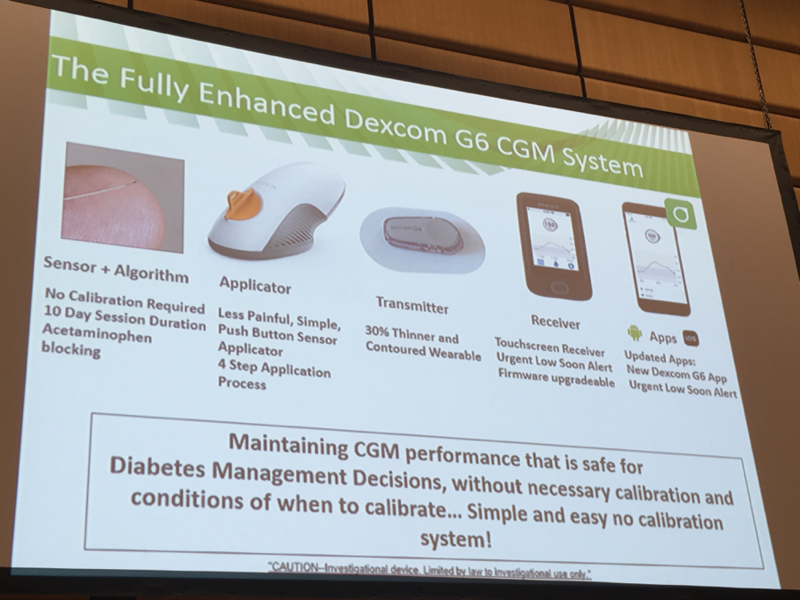 We were excited to see such a focus on CGM, hypoglycemia prevention, time-in-range as an outcome beyond A1C, and accessibility of diabetes technologies. Stay tuned for more details on ATTD 2018 highlights.